Hands flashing across the ivories, no sheet music before her. But there’s no need for it – the notes dance through her head, and she can drop or raise the music by an octave with very little effort. Not a day goes by that Myrtle Mashburn doesn’t play piano. 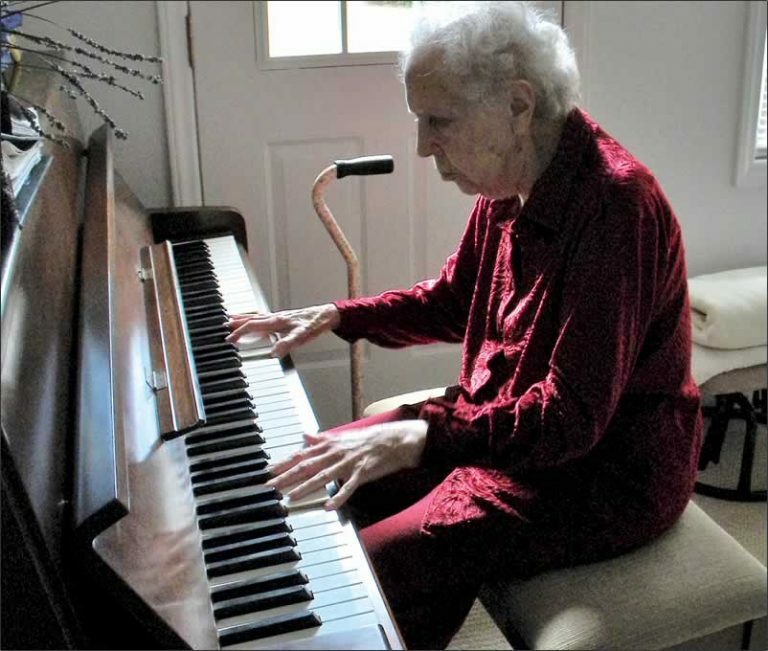 She’s been playing – and teaching – for many, many years and credits her love of music to her long life. 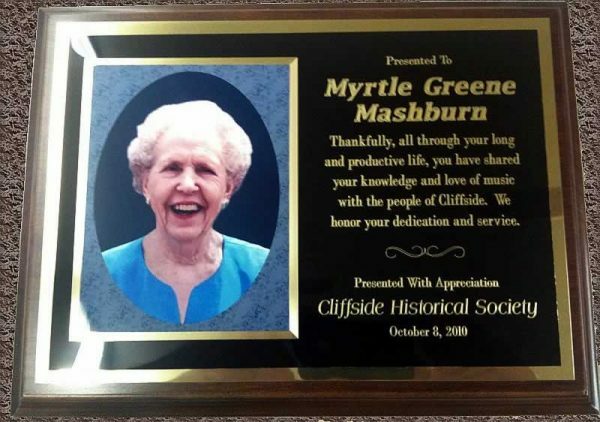 Mashburn, who will celebrate her 96th birthday in February, will be honored Friday night by the Cliffside Historical Society during its annual gathering. She was selected by the group for her many years as a piano teacher and an accompanist for the Cliffside School Chorus. A native of the area, Mashburn grew up in the Fairview community and attended school at Cliffside, where she later taught piano. “She’s known every principal,” said Phillip White, president of the historical society and former principal of Cliffside School. He and Mashburn worked together with the school’s chorus, a venture that lasted for 35 years. When her father paid attention to the fact she enjoyed music and could carry a tune, he told her mother he believed she was going to be musical. The music hasn’t stopped since. Mashburn learned to read after her father purchased beginner’s reader’s books at the department store in Cliffside and when she began school, she skipped both kindergarten and first grades. “I wanted to be a music teacher and that’s what I became,” she said. She first taught at the school, when students were allowed to take piano lessons there. Later she taught from her home, which was located across from the school. How many students did she teach over the years? “It would scare me literally to pieces if I knew,” Mashburn said. Former students remember her as an encouraging teacher who was supportive. Another former student, Thomas Sunday, said he also took lessons on Thursdays, but before school. Mashburn’s seen many changes in the small town where she grew up and lived adulthood. The school where she received a diploma is now home to kindergarten through fifth grades only, and the mill where her husband worked has closed and been mostly demolished. “It was such a whole difference in attitude and how people lived,” she said. Her husband, the late Frank Mashburn, she said, always wanted to be a doctor. But the youngest of 12 children, he had to leave school in eighth grade. It was because he believed in the importance of education the couple only had two children. “He said ‘We are going to educate them, and we can’t afford to educate more,”‘ she said. Daughter Jane wound up a doctor, her father’s dream, while son Jerry became a band director. Mashburn said she taught piano because she loved it and wanted to help out all she could with others who wanted to learn. “I enjoyed every bit of and loved what I did,” she said. “It was a wonderful profession, for me. The Fourth Annual Cliffside Historical Society Gathering will be held Friday beginning at 5:30 p.m. in Cliffside. 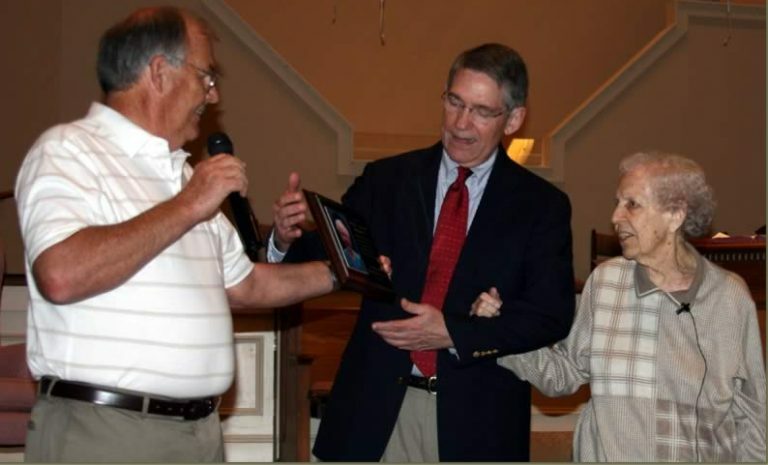 At the Baptist Church a large crowd came to honor Mrs. Mashburn for her service to Cliffside. After the plaque was presented, she was pleasantly surprised when it was pointed out that a large group of her former music students were seated together in the audience. 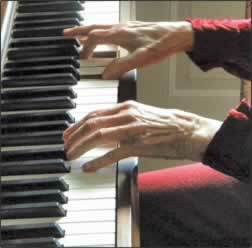 As she accompanied them on the piano, they sang many of the songs they had performed under her tutelage in years past.